After releasing his KOD in addition to efforts from Bas, EarthGang, Cozz and J.I.D last year, J. Cole is rallying the troops for another Dreamville Records compilation album. On Twitter yesterday (January 6), Cole broke the news by posting an invite to recording sessions for Revenge of the Dreamers III. Soon after, similar posts came from EarthGang, Bas, Cozz, J.I.D and more. While the comp has yet to receive a release date, the invite indicates that recording sessions will run from January 6 to 16. 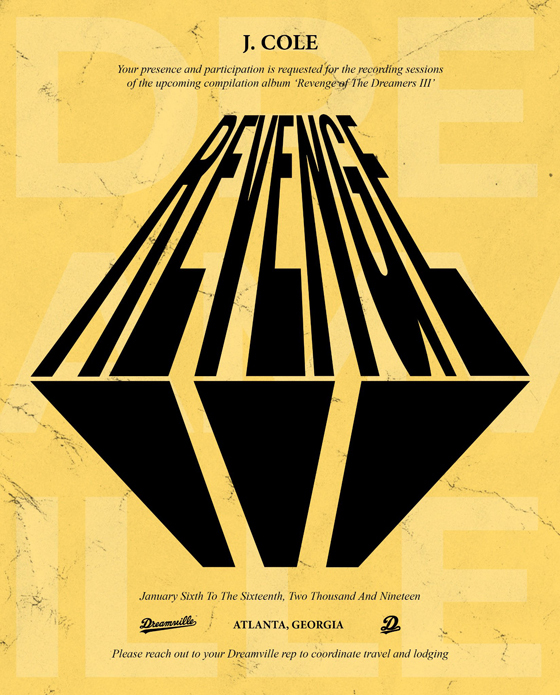 Revenge of the Dreamers III is set to follow Revenge of the Dreamers II, which arrived in 2015. Reason Signs to TDE, Shares "The Soul"